*Sunquest/CPL versions of Ol Monitor only. HMS does not have this. Note that I often end up advising users to leave "Status" unchecked and allow OL Monitor to automatically determine status. Reason: **If you are having problems with tests not showing, or having to have both statuses selected in order to see tests, it is better to just disable the status column option. Sunquest can sometimes be inconsistent with giving tests a status code. Having said that, it can sometimes be useful to define the statuses. If you are using the HRP module for example and employs special statuses besides the vanilla 'R' or 'U' for those entries. A status column, usually displaying 'R' for received specimens and 'U' for unreceived specimens is used by many sites. If your site does not use a status column the received or unreceived status can be determined by whether or not a collect time is present. Check the "Status" box if your site uses a status column. *A bug in the status code handling was fixed with version 1.66. Select which codes to load into the listbox below. 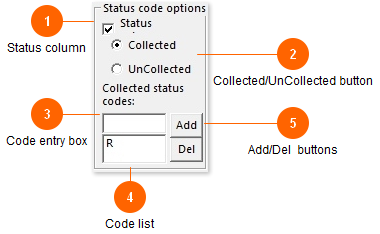 So if you select "Collected" here, all definde status codes corresponding to Collected status will load in the box. If the box appears empty, you will need to define some status codes. "R" typically stands for collected. "U" typically stands for uncollected. Add the status codes used by your site, ie 'R' for received/collected specimens. Multiple codes can be added if your site uses more. The list of associated codes is displayed here. In this example the collected code list only contains one code: "R". Use the add and del buttons to add or delete codes in the list.